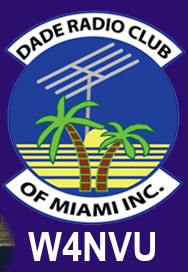 May 2012 Meeting Minutes – W4NVU – Dade Radio Club of Miami Inc.
Meeting was called to order at 19:36 with 27 present. We have a quorum. The minutes from last month’s meeting and the minutes of the last Board of Director’s Meeting were posted online and were approved. Corresponding Secretary – We do not have one. Merritt has the key and is picking up the mail. Treasurer’s Report – Esther gave the treasurer’s report and we have 50 paid members. Miguel announced that we have set up Pay-Pal so you can pay your dues online. We also have an online store. We made changes to the bank account to reflect the new officers. So far, Joanne, Esther and Miguel can sign checks. Robert was asked not to cut-up the credit card that he has until Miguel activates the one he received in the mail today. Miguel has the club shirts if anyone wants to buy one. They are $20.00 each are either white or blue. If you have not paid your membership dues, please do so. Website – Ryan advised that Miguel said everything. He stated that everything is pointing to the correct place. Ray said that we need to consolidate all of the domains in one place. Ray said that he was happy to help. All of the website domains of the club were discussed. Club Elmer/PIO Officer is Frank. He has been contacting new members and inviting them to the meetings. He has sent out Press Releases for Field Day to the major stations. They have all been flooded with other clubs too. Telemundo is the only one that responded that they may be interested. He discussed the club badges. The company can put on our logo, name and call sign for $4.89 based on 100. We do not have to order them all at one time. There is a $10.00 set-up fee, which Frank got down from $80.00. He suggested that we can charge $10.00 – $12.00 each to make some money for the club. Merritt asked what was the price for 50 and Frank advised that the price goes up to $9.00 each. Frank made a motion to order the100 badges and sell them for $10.00 each, seconded by Agustin. Miguel took a vote and the motion passed. Miguel advised that Frank, Tom and he are all going to the Hamfest in Dayton to promote our Hamfest here in February. They have paid for their airfare themselves. Letters are going out to all vendors this week. Dave came in from the other room. He announced that Hector Corona is the newest Tech and the first one this year to pass at 100%. Congratulations Hector! Armando advised that the next Tech class may be hosted here at the EOC. Anyone interested please send an email to Armando. His email address is KG4LYD@gmail.com or you can reach him through Twitter. The classes will be 3 consecutive Saturdays from 8:30 AM to 12 Noon. The last Saturday of the classes, you will break for lunch and come back and take the test. He is shooting for the last week in May or the 1st week in June. TBA. Robert stated to let the Coast Guard and Florida Fish and Wildlife know. They are always looking for emergency training. The Repeaters were skipped tonight since we just discussed them at the recent Board Meeting. Hamfest was discussed. Robert has the corporate filing of the Club in a book that he kept that was going to be thrown away. It was discussed that the Club had a committee chaired by Virgil to make changes to the Club’s By-Laws. It never happened and the By-Laws were not changed. Miguel said that we did vote at a meeting last year to keep the Club’s By-Laws for now and use the SFFMA By-Laws as guidance as needed. [Joanne found it in the October 20, 2011 minutes and read the paragraph.] Robert stated that we need a budget for Hamfest before anything can be paid. Miguel advised that the budget was approved three months ago and he brought it up on the computer screens. He had rounded it off to $19,000 for the facility and as a total for everything it was budgeted at $26,000.00, including the flyers, etc. Robert said that we haven’t sold any tables yet. Miguel stated that he, Tom, and Frank are going to Dayton’s Hamfest and the letters have gone out to the vendors. We have had a great response on the website. The website is up and running at Miamihamfest.net. Merritt made a motion to pass the budget presented by Miguel tonight, seconded by Joanne. A vote was taken and the motion passed. Robert abstained. Dave brought up that we may need an antenna or antennas. It was discussed that we could use one antenna for everything. Dave made a motion to purchase an antenna if necessary for D-Star, seconded by Ray. A vote was taken and it passed. It was stated to not buy the antenna until the site has been assigned. Virgil brought up the antenna party for Shep Favor. He is moving to Eastridge. He has a 60’ crank-up tower. Hopefully, it can be done in two steps the Memorial Day weekend. Friday afternoon starting at 6 PM, four people are needed to show up at Shep’s house to crank down the tower and lay it over on a ladder. Saturday at 10 AM the antenna will be taken off the tower and marked carefully so that it can be put back together again. The rotor will also be taken off. Virgil believes that it will take 4 hours. Shep will provide drinks, food and goodies. They also are in need of a well driller because of the pipe in the ground that needs to come out or a crane. Shep lives at 4722 SW 89 Court. Miguel told Virgil to send out another email. Robert announced that he had some free stuff to give to anyone that wanted it. Ray spoke about the sun spots and that he went to a 4 day seminar on EMP’s. If we have one like we had in the 1850’s it can have a big impact on the grid, high voltage transformers will be fried. He said to think about multiple days without power. It will have a bigger impact on the northern latitudes. John asked if anyone had a Yaseu contest. Miguel won the hat. Congratulations Miguel! Miguel announced that our club is going to talk to George Thomas tonight via Skype after the meeting. Miguel thanked everyone for coming. A Motion to close the meeting was made by Dave, seconded by Ryan. Voted and passed. The DRC meeting was adjourned at 20:16. Via Skype the club members participated in speaking with George Thomas W5JDX. He gave a great presentation and a lot of information. He spoke about Ham Nation, which is a live presentation with ham radio guests and how to build stuff. There are also downloads on the internet at twit.tv. He also spoke about amateurlogic.com. This is mostly pre-produced segments which are about 10 minutes each on different topics. He can also be found on YouTube – put in G.Thomas or on amateurlogic.com. He displayed different projects that he has made. He also took questions from the club members present. The Skype conference was completed at 20:52.